The Indian women's hockey team slumped to a fourth straight loss against New Zealand as they suffered a 0-3 defeat in the penultimate Test of the five-match series here on Friday. 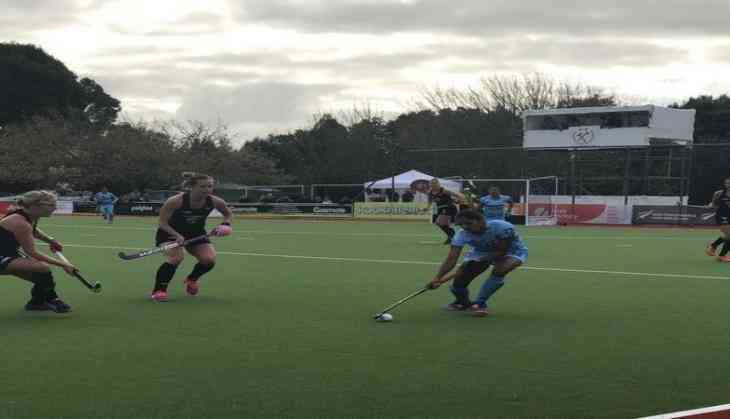 India made a strong start with an improvised attack, attempting shot on goal but the Black Sticks defence continued to be too strong to be beaten. Meanwhile the hosts found an opportunity in the 14th minute with a quick-thinking Rachael McCann who pumped the ball into the goal clinching an early 1-0 lead in the first quarter and put India under pressure. Following three successive 4-1, 8-2 and 3-2 wins in the first three matches, New Zealand looked to dominate today's game too. Tessa Jopp fetched the host-team their second goal in the 17th minute. New Zealand earned a penalty corner which was successfully converted by Jopp. Down by two goals, Indian strikers made strong amends trying different variations at converting a goal but could not break the Black Sticks defence. In-form Rachael McCann struck her second goal of the match in the 26th minute to take New Zealand's lead to a comfortable 3-0 at the end of half-time. The final two quarters saw Indian keeper Rajani Etimarpu stay busy at the post, defending the attempts on goal made by New Zealand. She made some impressive saves to keep the Black Sticks from taking further lead. The Indian defence too stitched together a well-structured strategy to ensure a goalless third and fourth quarter. While India had dominated with the ball possession (57 per cent as opposed to New Zealand's 43 per cent) in their previous game where they lost 2-3, New Zealand came up with new tactics to deny India any such advantage on Friday. The final quarter too saw India make strong attempts on goal and comeback into the game but New Zealand stayed in control to win the match 3-0 and take an unassailable 4-0 lead in the series.